Renault Trucks UK Ltd has handed over the keys to its first 26t hybrid to enter service in the UK to Norbert Dentressangle. The vehicle, a 26t rigid Renault Premium Distribution Hybrys, will operate from Norbert Dentressangle’s depot in Aylesford, Kent. 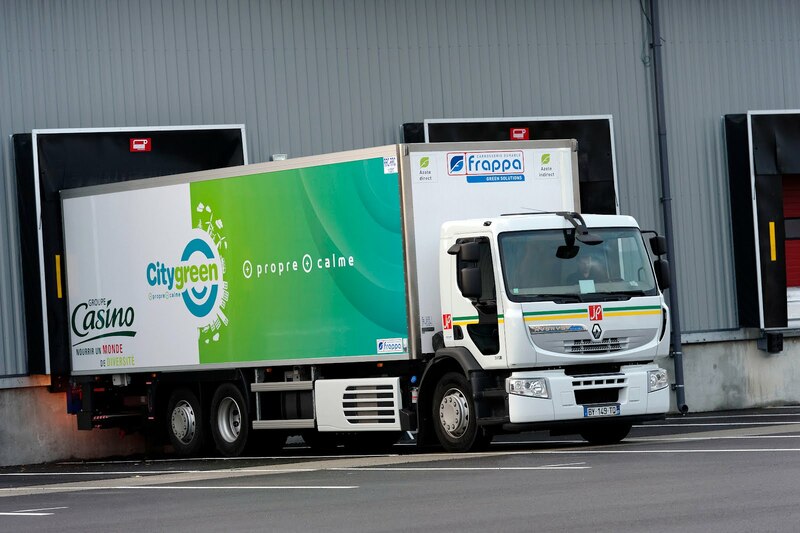 It will be making deliveries into London, often at night and in the early morning, where the benefits of the diesel-electric hybrid technology in terms of low noise, reduced emissions and improved fuel consumption will really come into its own. Renault Trucks believes this is the first UK registered 26t hybrid to go into service in the UK on a ‘distribution’ operation. 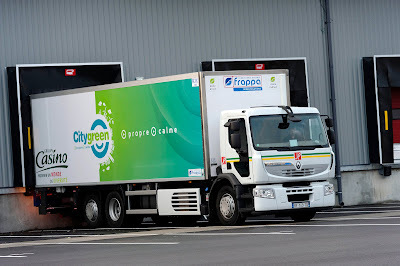 Renault Trucks’ hybrid technology is particularly suited to this type of distribution operation in urban environments. In addition to an appreciable saving in fuel consumption, which can be as high as 20% with optimum use, it also significantly cuts noise levels for those living in the vicinity, to no more than 74 dB, again when in all-electric mode. This being the equivalent of two people talking in low voices. The new Renault Premium Hybrys Tech going into service with Norbert Dentressangle UK is a 26t 6x2 310hp vehicle with a 8.4m box body with tail lift. It will be supported in service by two specially accredited ‘Clean Tech’ dealers in Renault Trucks’ UK network. MV Trucks at Maidstone and Renault Trucks Essex in Grays. Staff at both dealerships have been fully trained to service and maintain the vehicle and have invested in special bays, tooling and equipment to meet Renault Trucks’ Clean Tech standards for alternative energy vehicles. Renault Trucks has been perfecting its hybrid technology over the last few years & continues to develop its solutions to meet the growing needs of operators for quieter, more fuel efficient & less polluting vehicles. The Renault Premium Distribution Hybrys is already in operation in a number of companies, including SITA and the Greater Lyon Authority for refuse collection and building site supply, plus Colas and Coca-Cola for distribution operations. Norbert Dentressangle has also been operating two Renault Trucks’ hybrids in Lyon & Paris for the last ten months. Demonstrating the wide breadth of operations this technology is suitable for. This type of diesel-electric hybrid is known as ‘parallel’ hybrid technology, combining an internal combustion engine with an electric motor. They supply power to the wheels according to different distribution scenarios: either with both in parallel, or separately. The principle of this technology developed by Renault Trucks is very straightforward: the vehicle's kinetic energy is recovered during braking or deceleration phases and converted into electricity. This is stored in the traction batteries which therefore operate perfectly independently and do not need to be recharged. An engine shut down function enables the internal combustion engine to be automatically switched off when the vehicle is at a standstill. When the vehicle is started up again, the energy stored in the batteries is used to power the electric motor. At a speed of up to 20 km/hour, the diesel engine starts up and takes over. It is then only used in the phases during which it consumes the least, i.e. apart from the start-up phase. The electrical energy is also used to power the safety and comfort functions which are usually connected to the internal combustion engine, such as the power steering or the cooling system for the electrical equipment. All of this results in the vehicle's overall consumption and CO2 emissions being reduced by up to 20%. Apart from reducing emissions, hybrid technology generates very little noise pollution - no more than 74 dB when operating in all-electric mode. Under these conditions, hybrid technology proves to be perfectly adapted to early morning or even night-time urban applications, which are constantly alternating between phases of acceleration and deceleration. Concerned by the need to provide a quality of maintenance identical to that offered for vehicles powered by internal combustion engines, Renault Trucks has developed a specific accreditation, ‘Clean Tech’ which is awarded to qualifying repairers in its network. This is because with these new technologies it is necessary to develop specific skills and install the appropriate tools required for servicing this type of vehicle. In the UK dealer network, MV Trucks at Maidstone and Renault Trucks Essex at Grays have made investments in the region of £10,000 in the necessary tooling and equipment to enable them to meet the Clean Tech standard, which includes a designated bay to handle this vehicle, due to the additional electrical requirements. Additionally, both dealerships have invested in the training of their workshop and customer service staff to ensure that the Norbert Dentressangle hybrid is properly supported in operation.